A well designed headboard is the icing on the cake of your new bed. And while the flavour of the sponge may direct our choice of cake, this doesn’t mean the icing is ever any less of a big deal. Far from it. And that’s why, at Millbrook Beds, our range of luxury headboards are handcrafted to the same high quality standards as our luxury beds. Whether your sense of style leads you towards clean straight lines, softer romantic curves or a classic deep-buttoned look, you can find that luxury finishing touch to the style and function of your bed and your bedroom in our collection of handcrafted headboards. 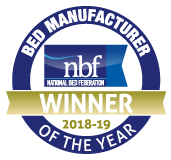 Choosing a luxury bed from Millbrook Bed puts you in the driving seat as, because we hand-make our beds and mattresses, you can choose the comfort, storage and size bed that is the perfect fit for your sleep. Choosing your headboard is no different. There are twelve luxurious headboard styles to choose from and many many more fabrics, enabling you to match your headboard perfectly to your bedroom colour scheme as well as your bed base. So now you can choose your icing as well as your cake, how often in life do we get to do that?